Last chance to move in before Christmas at Crofton! We’re treating you to a bumper pre-Christmas bonus on Plot 4, the Brearley at Crofton: carpets, curtains, light fittings and £500 towards your legal fees* are all included in the £330,00 price, if you reserve before 15th November! As it’s all ready to move into, you could wake up on Christmas morning in the stunning 4 bedroom Brearley, with a stylish kitchen to make light work of the Christmas turkey, four bedrooms and two en suites for those extra Christmas guests and lots of space for entertaining and relaxing. The Brearley kitchen is a showstopper, with high quality, rigid built wall and floor units by top manufacturer, SieMatic. Hard wearing Corian worktops and Neff appliances, including the ‘Slide&Hide’ oven (as seen on The Great British Bake Off!) give this home a premium feel. A 4 zone ceramic hob, fridge/freezer and built in dishwasher are included as standard. And the garage can be accessed from the kitchen, which is an added bonus. As you first step into the Brearley you are met by a light hallway. From here, you can enter the kitchen, or the spacious and welcoming lounge that is filled with natural light thanks to the bay window at the front of the property. The lounge leads into the dining room through double doors. This room can also be accessed through the kitchen which is ideal for entertaining guests in your new home. There is also a handy downstairs WC. Upstairs are four bedrooms, with the master bedroom having the benefit of an en suite and bedrooms 2 & 3 sharing a useful Jack and Jill en suite. There is also a stylish family bathroom with Porcelanosa wall tiling around the bath and inset chrome LED lighting. Crofton offers home owners the ideal location. Alsager is a thriving community, with a range of local shops, highly rated schools, good transport links to the M6 and a regular Alsager to Crewe train service. 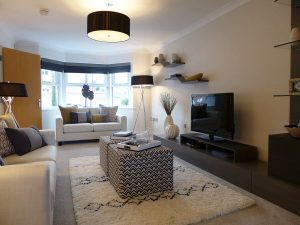 The Brearley is eligible for the Government backed Help to Buy scheme. This allows buyers to secure their new home with just a 5% deposit. The Government will then lend a further 20%, meaning only a 75% mortgage is needed. This isn’t just for first time buyers and we have lots of other buying methods too; have a chat with our Sales Advisors who can put you in touch with an Independent Financial Advisor and help you find the ideal buying method to suit you. Could you see yourself in a Brearley this Christmas? 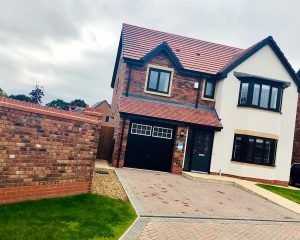 Our show home is open Thursday to Monday 10am – 5pm and offers the perfect opportunity to experience for yourself Seddon Homes’ build quality and finishing touches. Call our Sales Advisor on 01270 872 640.